A space occupying lesion is any abnormal tissue found on or in an organism, usually damaged by disease or trauma. 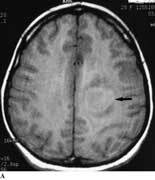 A space occupying lesion of the brain is usually due to malignancy but it can be caused by other pathology such as an abscess or a haematoma. Almost half of intracerebral tumours are primary but the rest have originated outside the CNS and are metastases. Personality change – irritability, lack of concentration, socially inappropriate behaviour. Brain tumors cause neurological disorders. Symptoms occur sequentially. This emphasizes the importance of history in the examination of the client. The symptoms should be addressed in a time perspective. Neurologic symptoms in brain tumors typically considered to be caused by two factors focal disorder, caused by the tumor and intracranial pressure. Focal disruption occurs when an emphasis on brain tissue and infiltration / invasion of the brain parenchyma by direct tissue damage neurons. Of course the greatest dysfunction occurs in tumors that grew most rapidly. Changes in blood supply due to the pressure caused by the growing tumor causing brain tissue necrosis. Impaired arterial blood supply is generally manifest as an acute loss of function and may be confused with primary cerebrovascular disorders. Seizures as a manifestation of neuro sensitivity changes associated with compression of the invasion and changes in blood supply to the brain tissue. Some tumors form cysts that also suppress the surrounding brain parenchyma so that aggravate focal neurological disorders. Increased intra-cranial pressure can be caused by several factors: the increase of the mass in the skull, the formation of edema around the tumor and cerebrospinal circulation changes. Tumor growth causes increasing mass, because the tumor will take a relatively from the rigid skull. Malignant tumors cause edema in brain tissue. The mechanisms are not entirely understood, but due to the difference in osmotic allegedly causing bleeding. Venous obstruction and edema caused by damage to the blood brain barrier, all lead to an increase in intracranial volume. Observation of the circulation of cerebrospinal fluid from the ventricle into the sub-arachnoid laseral cause hidrocepalus. Increased intracranial pressure would endanger the life, when it occurs rapidly due to a cause that has been discussed previously. Compensation mechanism takes many days / months to be effective and therefore not useful when intracranial pressure arise quickly. This compensation mechanism among other works lowering intra-cranial blood volume, cerebrospinal fluid volume, intracellular fluid content and reduce parenchymal cells. The increase in pressure resulting in untreated ulcer or serebulum herniation. Herniation occurs when the medial lobe gyrus temporals shifted to inferior through territorial notch by the masses in the cerebral hemispheres. Herniation pressing metencephalon cause loss of consciousness and hit the third nerve. In the cerebellar herniation, tonsillar before shifting down through the foramen magnum by a posterior mass. Compression of the medulla oblongata and stop breathing occur quickly. Intracranial fast is progressive bradycardia, systemic hypertension (widening pulse pressure and respiratory problems).